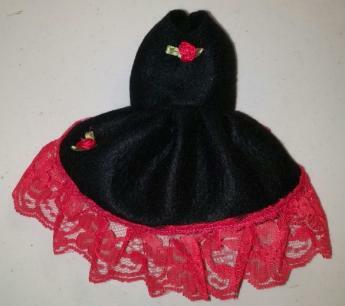 This is a little bitty Black Dress for a Lucky Little Pet Rattie with Red Roses and Red Lace. The waist measurement on this Dress is approx 7 1/2", it does have a bit of stretch in it, and the outfit is approx 6 1/2" from neck to tail. NOTE: YOU ONLY PAY SHIPPING AND HANDLING CHARGES ONCE PER SHOPPING TRIP AT MARNA'S MENAGERIE. ORDER ANY AMOUNT OF ITEMS (from the menu at the left) AND THE HEAVIEST ITEM IS THE ONLY ONE YOU WILL PAY SHIPPING ON ALL ELSE ORDERED AT THE SAME TIME, SHIPS FOR FREE.